This is a book I've been meaning to read for a long time, and always put it off. In a certain way, I thought listening to Susan Cain's Ted Talk was all I needed to know about the book, like a condensed version I didn't have to read. 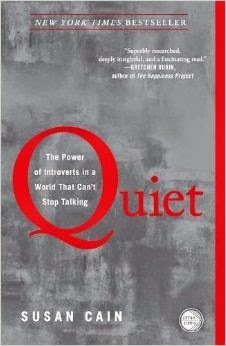 Quiet: The Power of Introverts is a must read from start to finish for everyone. Quiet seeks to accomplish two goals, to remove the cultural stigma introversion has faced in a western society that values extroversion over common sense, and to be a guide to introverts and extroverts alike to better understand themselves so that they may improve. It's no secret our culture values the extrovert, from childhood to adulthood we are taught to be more outgoing. Susan Cain explains how this phenomenon began, as we used to be a society that valued thoughtfulness and introversion, and she also showcases the pitfalls in having everyone chase the extrovert ideal. And to no one's surprise that ideal negatively impacts the well-being and productivity of nearly half the human population. Quiet does a good job explaining how simple mistakes are made from a persona level to a business level by ignoring many of out introverted tendencies to seek solutions, and instead opt for extroverted means that are more socially acceptable, even if they have a much increased chance of failure. This is a call to respect ourselves for who we are and embrace it, as well as a critical talk to our social extroverted norms. The other side of the coin is a guide to introverts and extroverts to how to improve themselves, their relationships with others, and their professional lives. What could have been a book priasing introverts becomes an insightful look to how we operate as people. The most important aspect of this book is the reader is honest with themselves about who they are, so that they can begin to apply that knowledge in their daily life. It is also an honest look at how to interpret and understand others, as so much of life is social. This is definitely a must read, and if you are anything like me who put off reading this book for years, do yourself a favor and give it a chance.